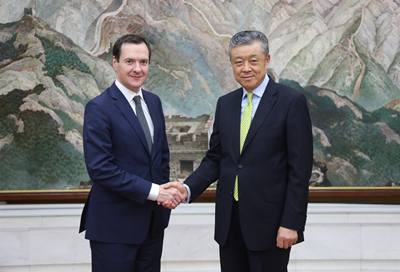 On January 16, 2019, Ambassador Liu Xiaoming met with George Osborne, former UK First Secretary of State, former Chancellor of Exchequer and Editor of the Evening Standard, at the Chinese Embassy. Ambassador Liu spoke highly of Osborne’s contribution to China-UK relations while he served as First Secretary of State and Chancellor of Exchequer, hoping that Osborne would continue to give his attention and support to the relationship between China and the UK, and the Evening Standard would play an active role in enhancing the understanding of China in Britain. The Ambassador pointed out that 2019 marks the 70th anniversary of the founding of the People’s Republic of China. China will further deepen reform, expand opening up, and follow the path of peaceful development firmly so as to make greater contribution to the world peace and development. China’s progress has brought huge opportunities to China-UK relations. He expressed the hope that China and the UK would work closely to tap the potential for China-UK cooperation and promote steady progress in the “Golden Era”. Osborne commended China on its great achievements, saying that he attaches importance to and supports the cooperation between China and the UK and will continue to make efforts on it in the future. The Evening Standard stands ready to report China comprehensively and objectively, and enhance the understanding of China in the UK in order to create a favorable environment for the development of China-UK relations.